Home Ravinder Singh Book Review: Can Love Happen Twice? 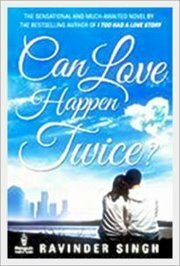 Can love happen twice is the second part of Ravinder Singh bestselling novel I too had a love story. In I too had a love story there was a true love story of Ravin and Khushi which brings tears to a lot of people eyes including me. In this book the author focus on Ravin's life after the death of his beloved Khushi. Ravin's three friends begin reading a handwritten copy of Ravin's incomplete second book in a radio station in Chandigarh. After a year and a half since Khushi's death, Ravin moved to Belgium in the hope of change where he meets Simar an MBA student. They start dating each other very soon and as every love story, they also have their differences and problems where both want to settle in different places after their marriage. It's a story about priorities, adjustments, expectations, judgment, and disappointments. Overall it's a-okay book to read because the author doesn't match the expectations of readers this time. The love story of Ravin and Khushi was far better than Ravin and Simar's, and it's also obvious to compare two of these relationships with each other. I guess Love can happen once only but if it happens twice than it is not well written or described in this book. You can read this book if you are curious to know that what happens to Ravin after the death of her true love. Otherwise, it's not worth reading. True Love is unconditional. And if it is a 'Conditions Apply' scenario, then it isn't true love.